traveling for thousands of miles. We have named them whales. 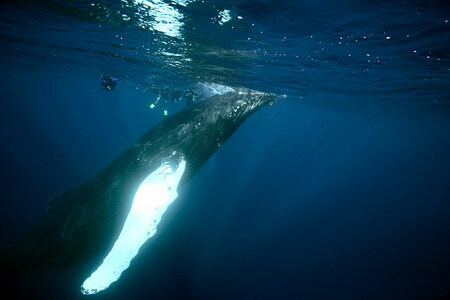 Hundreds of fathoms down, moving effortlessly, appearing to move slowly with each powerful movement of their huge tail, the whales pass through the oceans traveling great distances. A vision of power and serenity, they are content in their ocean world. 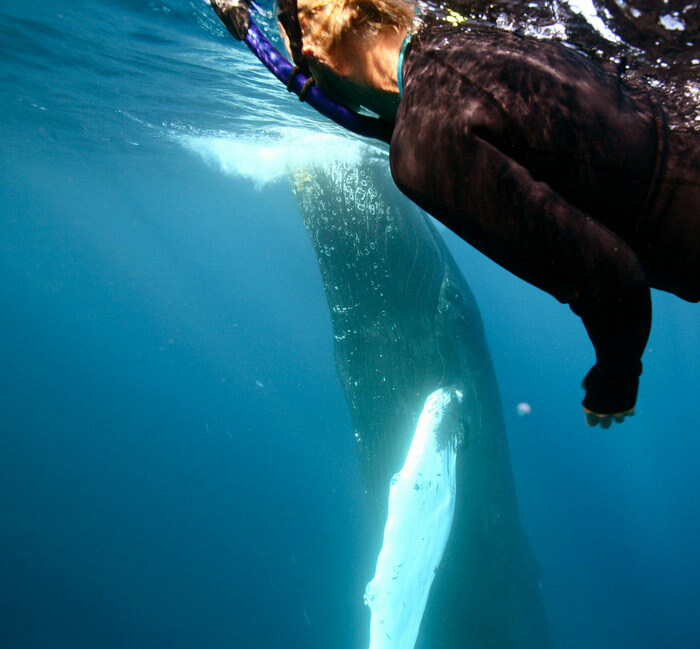 This is a story about my relationship with the fifth largest of the great whales, the mysterious and gentle Humpback Whales. 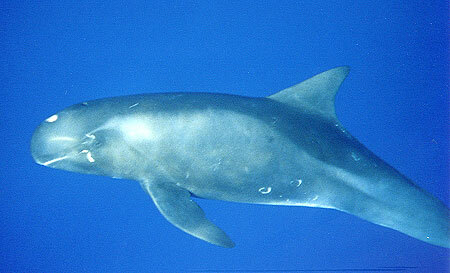 Mostly charcoal gray with white bellies, having an immense head with relatively small deep brown eyes, tiny ear slits, sensory nodules on their head  each containing one hair for touching things  like the bottom of our boat, and sensing things in their environment  such as water temperatures, currents and vibrational frequencies, a double vented blowhole, voluntary breathers  choosing each breath they take, small dorsal fin on their backs. 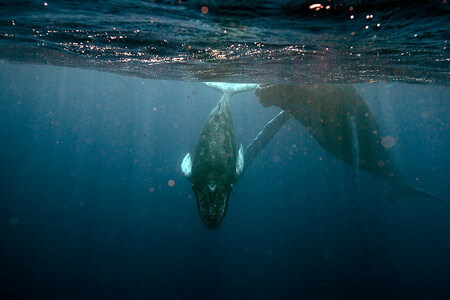 They are baleen whales (having no teeth), with deeply grooved pleats on their underside, weighing 60-70,000 pounds, having long white pectoral fins, a fifteen foot expanse of tail, the adult females are larger than the males, approximately 40-70 feet in length.  Aware of the electromagnetic Light grids of our planet, they enter these frequencies to communicate with the Earth herself. They communicate in hydrodynamic realms, understanding the life-giving forces of our water environment that covers 71% of our Earth. 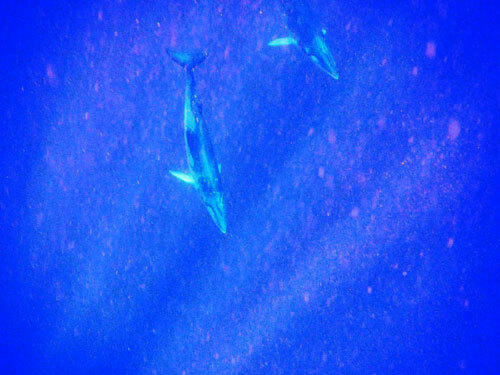 Let yourself go deeper and deeper with these sensitive whales, into endless expanses of blue, into the unknown. Open yourself to their communication, setting aside your use of voice and remembering our first mode of contact: VIBRATION. Let their sounds  far beyond your ability to hear  enter your awareness. 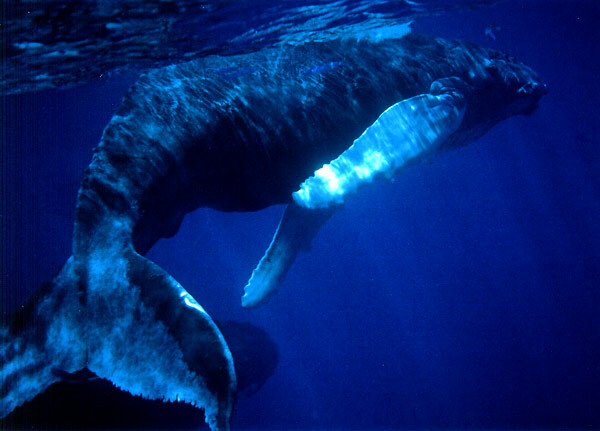 What can we learn from the whales? What are their dreams and their feelings  their experiences with the mind-expanding effects of diving deeply into ocean environments and multiple octaves of sound? Who do they meet, fathoms deep in the ocean? What do they see and know? .. long before we are ready to ask the questions. 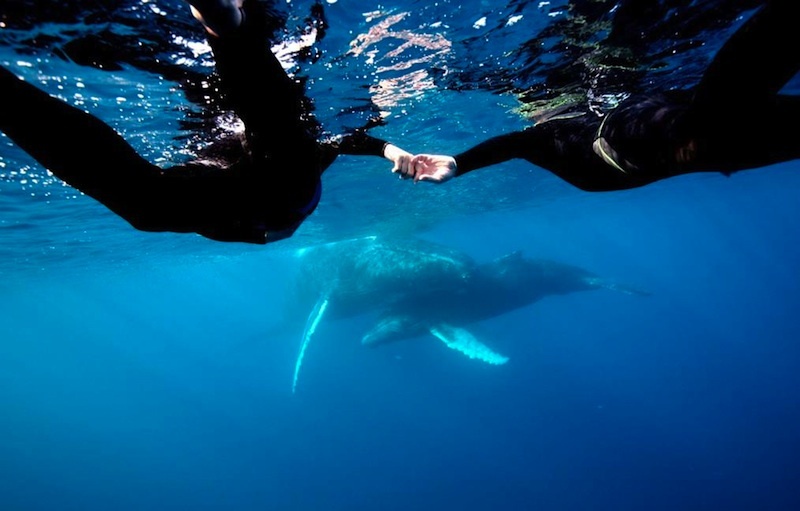 .. in the mystery and beauty of our shared watery world, beyond time and space, I feel the Love. 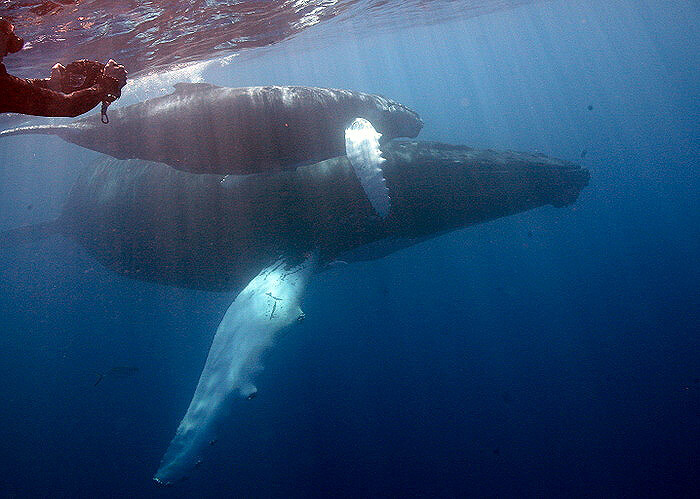 In my dreams I meet the whales who are the molecular librarians of the Earth's evolution. What we call the "Akashic Record" is living in the oceans of planet Earth, contained in the water molecules, where information is stored. Since water is never destroyed, only recycled, all of Earth's history remains safe in these ocean archives. 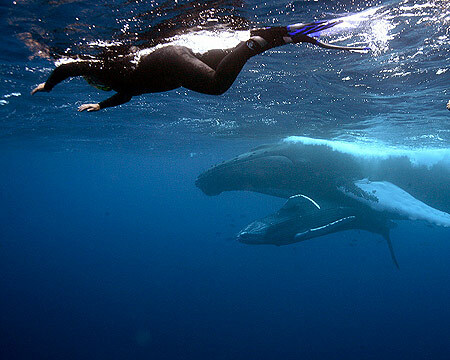 The whales can access the information, circulate it and contribute to it  communicating by contacting the intelligence in the water molecules which enter matter and travel through it. 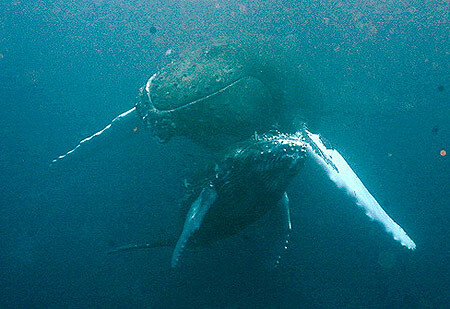 Without vocal cords, the Humpbacks produce complex sounds that are the highest and lowest that our human ears can hear. Their songs, even those not heard by human ears, are powerfully amplified, and go deeply into us, resonating our bones and our entire bodies, awakening our memories of ancient connections. Telling their stories, they joyfully sing their lives to us. 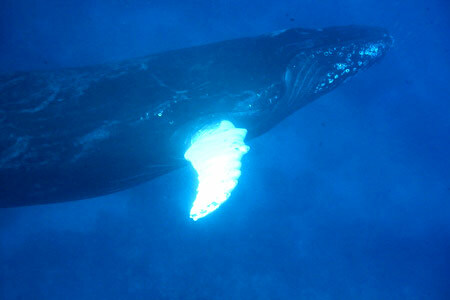 Join us with the gentle Humpback whales in Hawaii and the Caribbean. 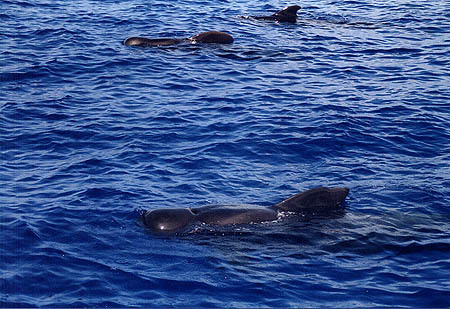 These short-finned Pilot whales live two to five miles offshore and swim seasonally up and down the Kona coast - this is their home year round. 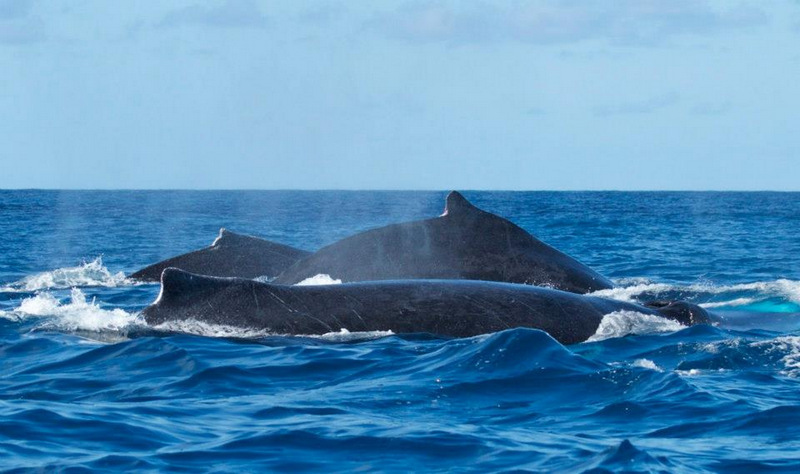 As we quietly approach them we feel privileged to see them basking in the sun and logging on the surface - only the tops of their heads and their dorsal fins in sight. The Pilots are a very pod-oriented species, staying together under all circumstances. 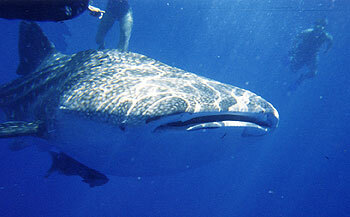 They are 12 to 20 feet in length, and are usually seen swimming in two groups of 25 to 35 each. 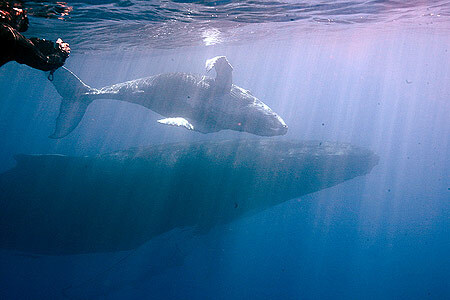 All the moms and young ones tend to swim together in one pod. We see the largest number of newborns in July and August. The babies are nursed for two or more years. 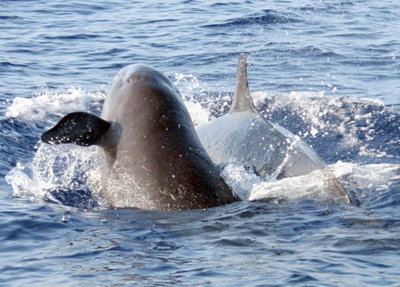 These friendly Pilot whales seem to enjoy looking at our boat! 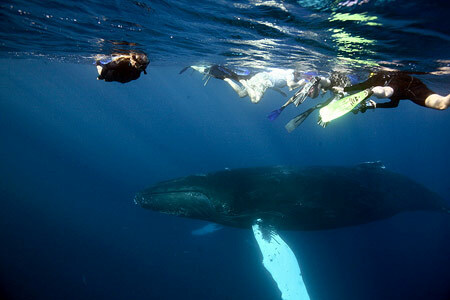 First, one whale will come alongside and poke its head straight up out of the water, and then others follow suit. Soon 7 or 9 of them are spy-hopping and looking into our eyes. It is very comical and endearing. They are intelligent and curious as they observe us, revealing gentle brown eyes and large mouths with upturned smiles! 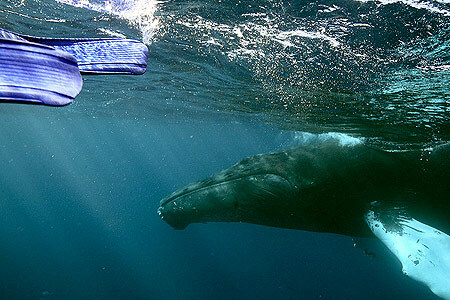 We then communicate with them to determine if it is appropriate for us to enter the water and quietly swim alongside. The Pilots are beautiful to observe, appearing dark blue and dreamlike in the ocean. They are comfortable with our presence and do not change their behavior, as we all move together, diving and swimming gracefully. 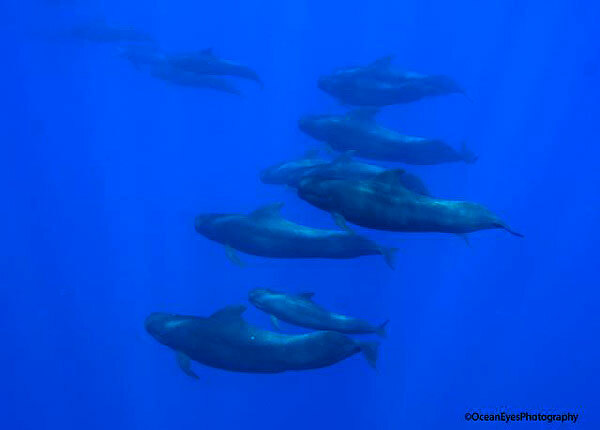 Occasionally a pod of Bottlenose dolphins swim along with us. 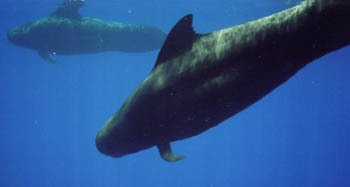 The Pilot whales were given their name because they have a history of leading boats into safe harbor during inclement weather. 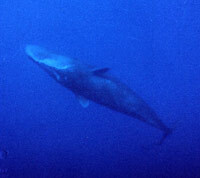 The Antarctic Minke whale is one of the smallest of the rorquals, and one of the smallest baleen whales. 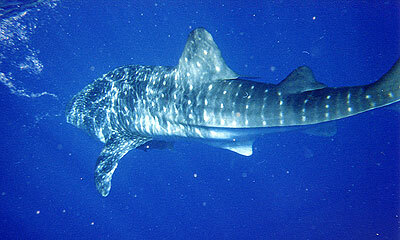 Length ranges from 24 feet to 35 feet and the females are about 3 feet longer than males. Their back is charcoal grey and the belly white. There is a double blaze of lighter grey on each side rising up from the belly. Flippers are dark with a white leading edge. 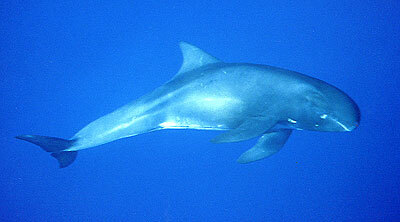 The Antarctic minke whale inhabits all oceans in the Southern Hemisphere. Its summer range is close to Antarctica, but it moves further north toward the equator in winter. 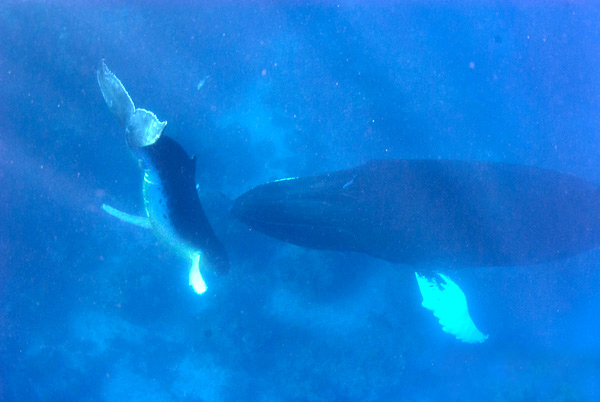 These whales when we met them in the French Polynesian waters were very interactive with us. Swimming among us for an hour, returning repeatedly and remaining on the surface where we could easily have close views and eye contact. They probably would have stayed longer, but we had to leave them, since it was lunch time and the captain had to prepare for an afternoon boat excursion. 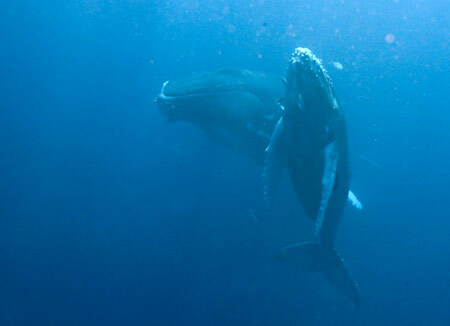 We swam with two of them in the waters of Rurutu Island in the South Pacific (September, 2011) They are usually found as solitary animals, or in small groups of 2 to 3. 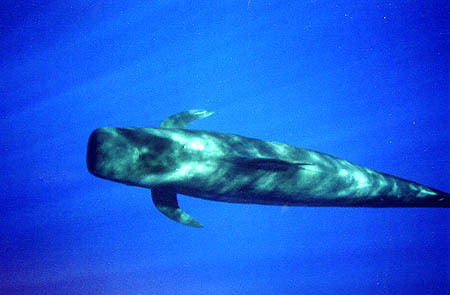 Bryde's whales are most common in tropical and sub-tropical waters. No one knows where breeding takes place. They have a bluish-gray body with white on the underside. Some of them have dark gray or almost white scars that may be caused by bites of fish that attach themselves to the skin and bore into the flesh. 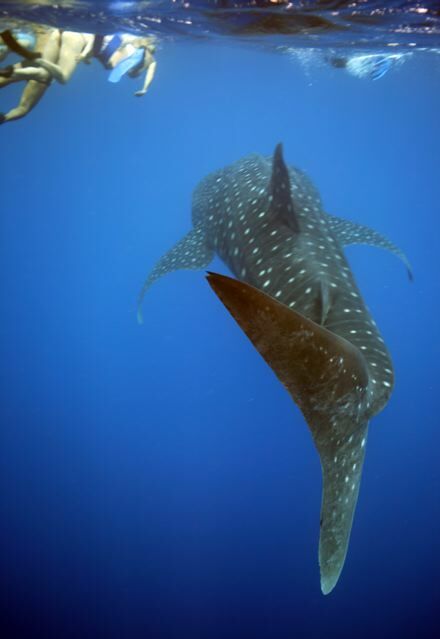 The pectoral fins are relatively short and pointed at the tips. 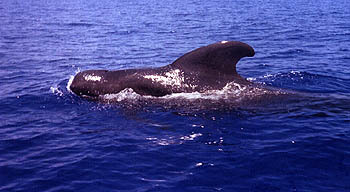 The dorsal fin is located about one-third of the body length forward of the notch in the tail. The tails are also relatively small in relation to body size. 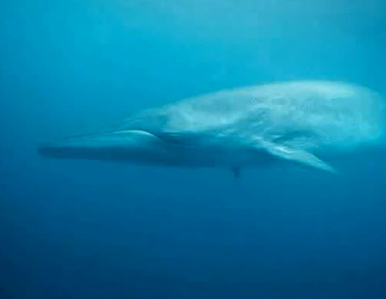 The Bryde's whale is 40 to 50 feet long. Females are slightly larger than males. Bryde's and Minke and Humpback are baleen whales having a series of fringed, overlapping plates that hang from the upper jaw inside the mouth where teeth would be. The plates are composed of a fingernail-like material called keratin that frays out into fine hairs on the ends. 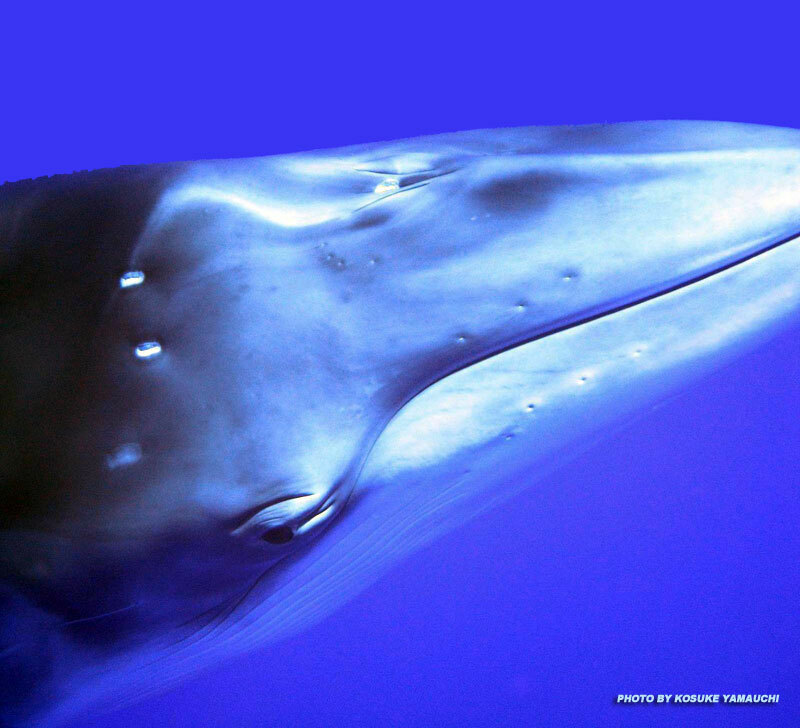 Bryde's whales have 250 to 350 baleen plates on each side, which are 16 inches long. 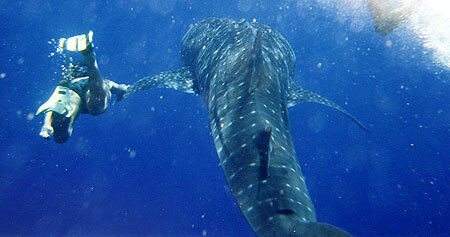 They are usually fish eaters, often feeding on schools of anchovies, sardines, herring, or mackerel. 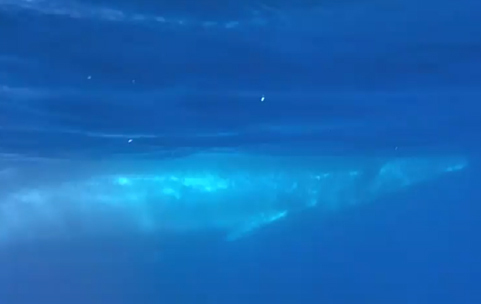 While feeding, the Bryde's whale displays a more regular up-and-down pattern, frequently arching its back quite high and diving for 5 to 15 minutes. 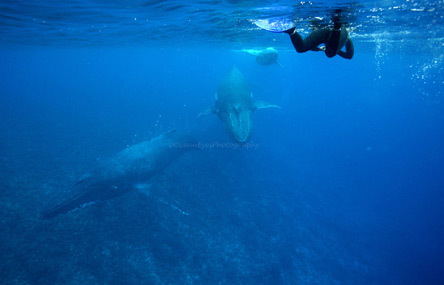 The marine specialists in Rurutu were very excited to photograph these whales since they had not seen them here before. 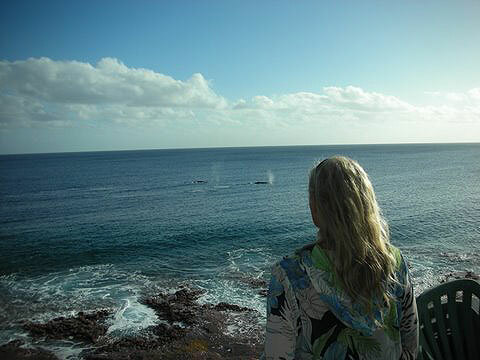 These little whales are seen on rare occasions along the Kona coast. 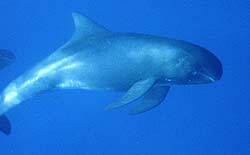 The adult Pygmy Killer whales are between 7 to 9 feet in length and weigh approximately 200-400 pounds. Here is one of many wonderful photographs taken by Lisa Denning of Dolphin House. It captures their sweet expression and gentle nature. 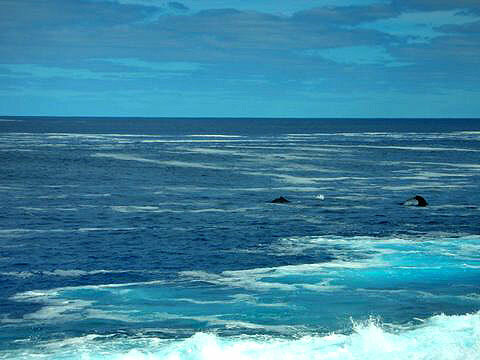 We have seen these disarming whales in small pods approaching our boat. They appear very inquisitive toward swimmers. Although they have a reputation of being aggressive in captivity, we have witnessed only gentle interactions among them and us. Their eyes, which can bulge and widen, exposing white skin around the iris when they are closely scrutinizing something, remain relaxed and softly observant when we swim among them. It is always a wonderful experience and special gift when they approach our boat in this friendly manner. they act like overgrown dolphins! They are known for generously sharing their food. 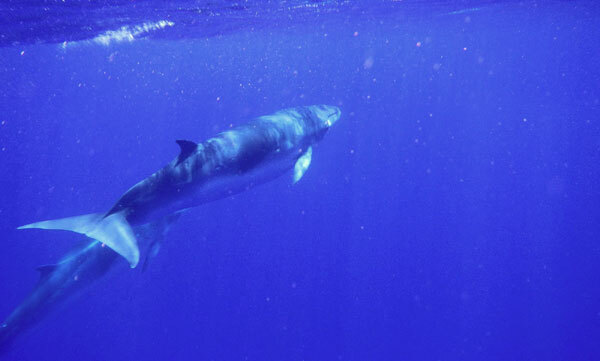 Recently one False Killer whale was observed bringing a large chunk of fish to other whales in his herd and giving it to them to eat as he circled nearby. The families remain together in pods, sharing and caring for each other. 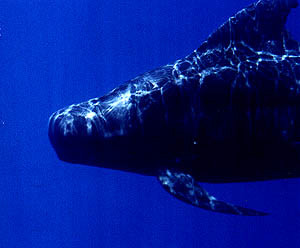 The bump or elbow on the leading edge of the whales' flippers is an identifying characteristic of this species. 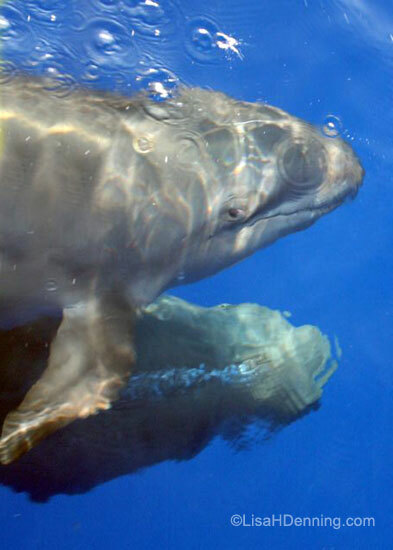 The photo of these friendly False Killer whales was taken by Lisa Denning of OceanEyesPhotography.com. The photo below is of Joan, Lisa, Ankie and Teri on a Hawaiian whale trip in 2001. 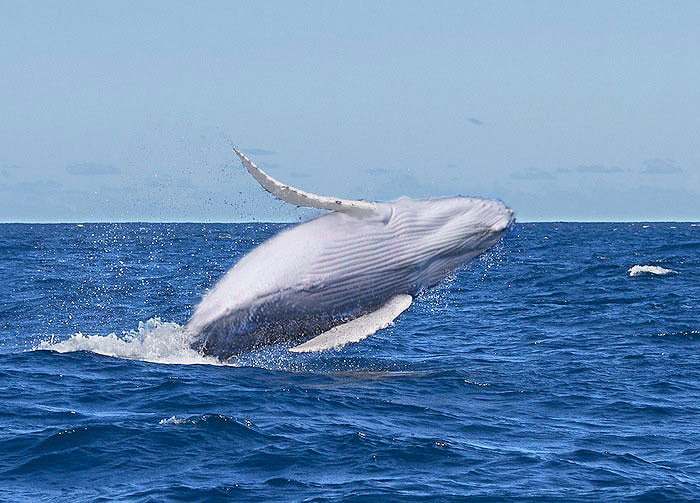 In Hawaii, our friends the fisherman often contact our boats to report their sightings of whales. On occasion the report is a sighting of 10 - 15 Orca whales, swimming twenty miles off shore. These "Hawaiian" Orcas swim from the Arctic to Antarctic and between Asia and America. I first met them at West Craycroft Island in the northern Pacific region. While enjoying time aboard a boat in the islands of British Columbia, Canada, the Orcas would come regularly to communicate with us via our hydrophones. As a guest of Jim Nollman, founder of Interspecies Communication, I observed and photographed the Orcas responding to our songs and laughter while we dialogued with them through the microphone. On one occasion - perhaps protesting our choice of music (? ), they trumpeted so loudly and so high, they blew-out the speakers on our hydrophone. They seemed to like Reggae the best, gathering closer to the boat whenever we played it. Their sounds are powerful, often spiraling to very high notes, beyond our ability to hear or record. 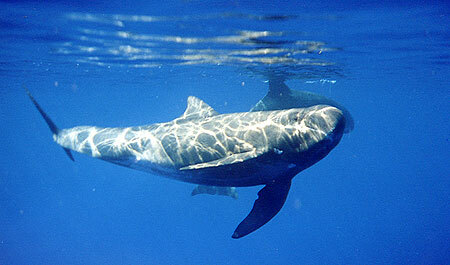 The Orca is the largest member of the dolphin family. 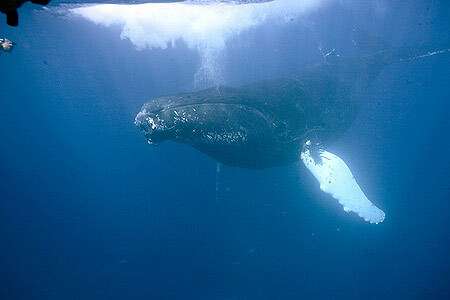 The word whale is mostly used to indicate size rather than zoological classification. 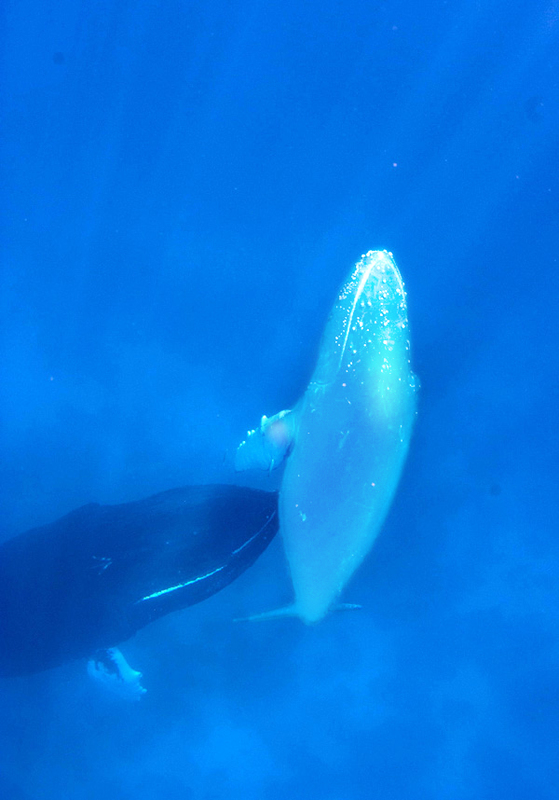 These beautiful black and white whales typically travel in family groups, which may number from a few to 50. From time to time, many of the pods have a reunion, gathering in very large numbers. 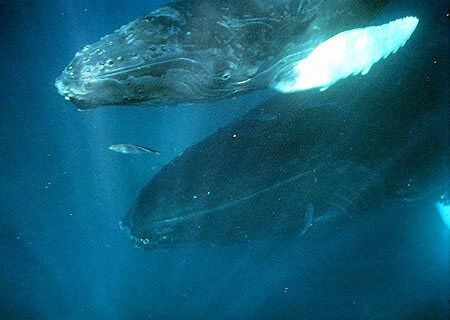 Despite their name we have nothing to fear from these gentle toothed whales. The Orcas are very peaceful by nature and the only aggressive behavior documented occurred in captivity where their abnormal environment causes abnormal behavior. 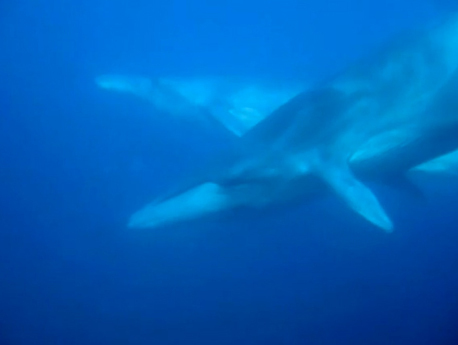 They are about 20 - 30 feet in length and records show they live over 100 years. The Orcas were among the first whales I met, elegant and dramatic-looking with their tall black dorsal fins and beautiful white markings. I hold them lovingly in my heart. I photographed this Beaked whale as she approached our boat one day when we were 3 miles from shore. She was alone and with our engine shut down, she chose to stay alongside our boat for a half hour before we departed. 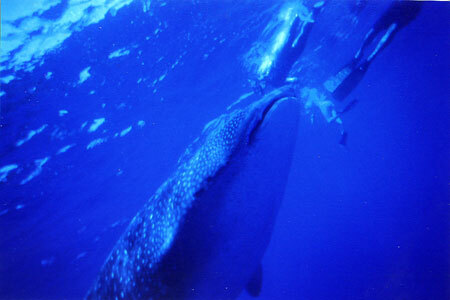 When we entered the water to snorkel, she approached us and remained with us. 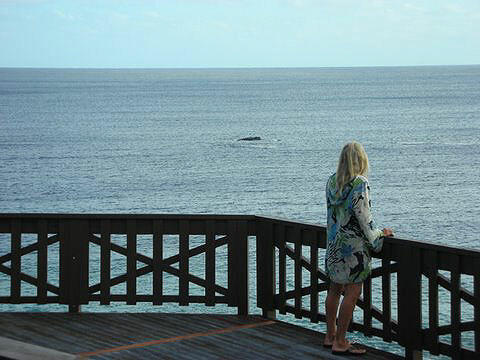 If I could put a human feeling onto this whale, I would say she seemed lonely and seeking out our company. 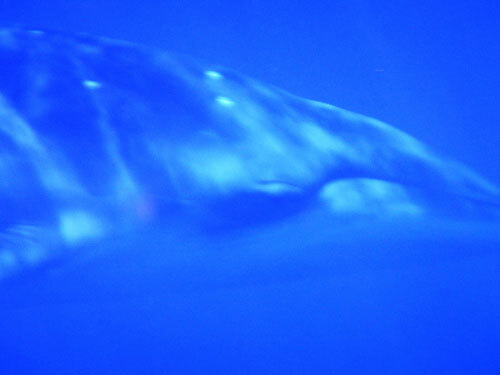 I have extensive video footage of this uncommon cetacean. 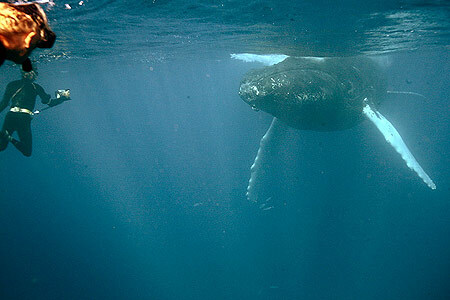 I first met the Sperm Whales (also called Cachalot Whales) in the Sea of Cortez, Mexico, where they share the water with many species of dolphins and whales, including, Fin whales, Gray whales and Blue whales. 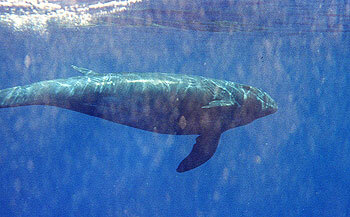 Here in Hawaii, the Sperm whales are usually seen in small groups 15 miles or more from the Big Island shores. 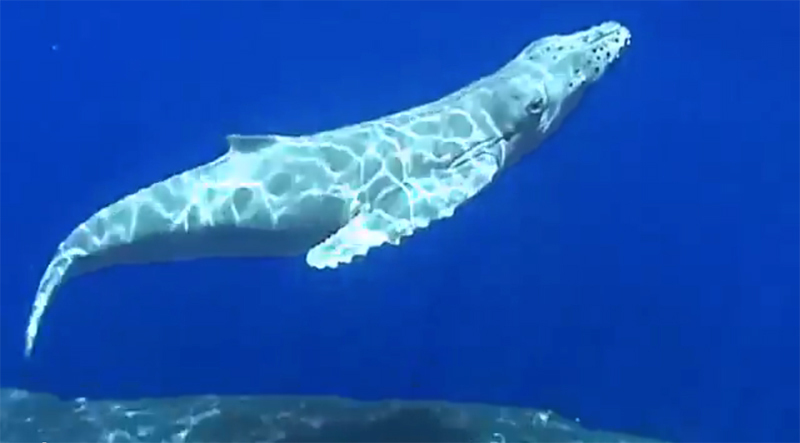 In general, these whales prefer to live in deep waters. 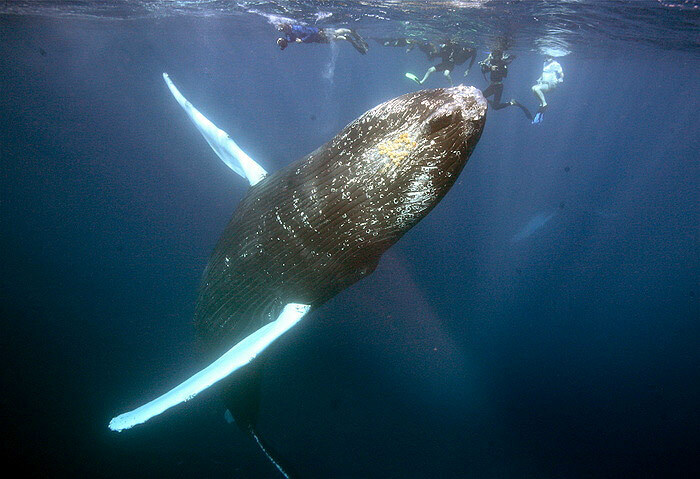 Diving deeply, they often remain underwater for more than an hour. 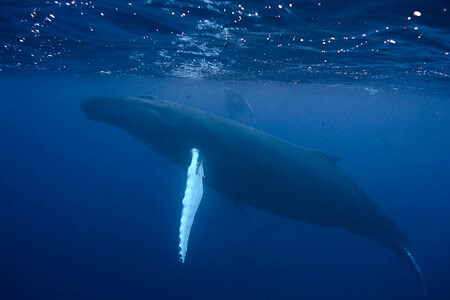 Recent research using hydrophones to detect the whales' echolocation clicking indicates these whales can dive 10,000 feet or more. At these depths, their lungs collapse, their heartbeat slows down and they rely on the oxygen stored in their muscles and blood to supply their heart and brain. 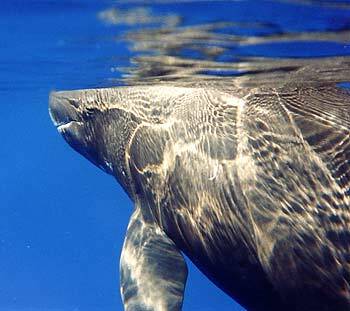 On the surface, they breathe repeatedly for ten to fifteen minutes, before diving again. 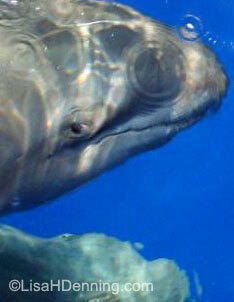 Their blowhole on the extreme left side of the top of their head can identify Sperm whales. They have a box-shaped head, small flippers and rippled skin. They have the largest brains on our planet. These brains are used for navigation and communication. In addition they have many other capabilities that function beyond anything we can as yet comprehend. 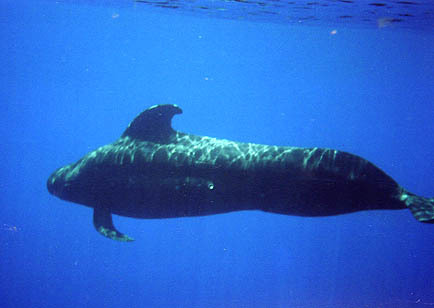 On August 12, 2001 a baby Sperm whale in distress was found close to our Kona shores. On that day and the day after, there were many sightings of whales, as the family pods seemed to come close to shore to accompany the baby. Although local fishermen and other concerned people came to the rescue, the whale did not survive. It is very unusual for young ones to be found apart from their mothers. The females are pregnant for 17 months, and nurse the babies for a year or more. The reproductive cycle is about four years. Often the mothers and babies swim in a group as a nursery pod, while the young males make up another pod. 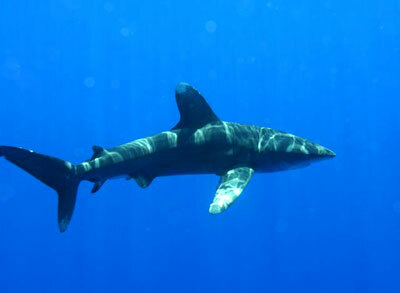 Older males may swim alone. 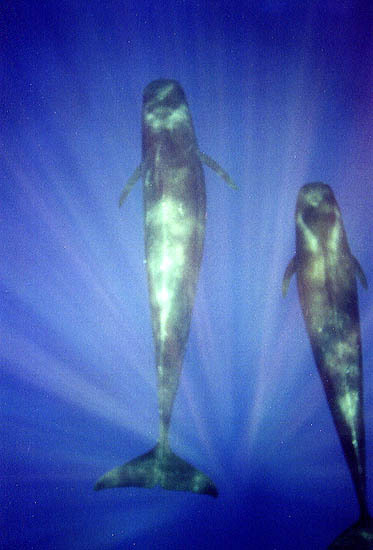 Females who are ready to mate may have a male accompanying their pod. These whales can be very playful, breaching and chasing each other, although most of their time is spent many fathoms deep. 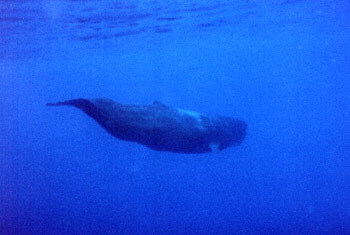 The mighty Sperm whales (aka Cachalot) with the largest brains on the planet, live in Hawaiian waters year round. 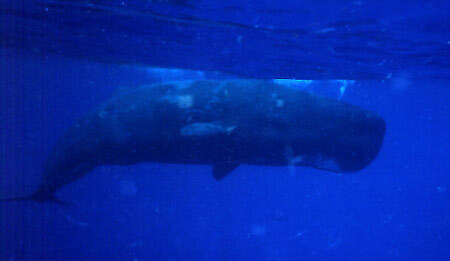 In April we met a very special young, female, Sperm Whale. 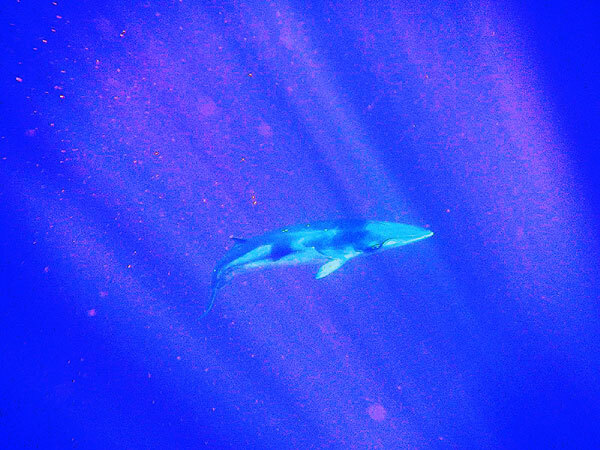 As we were swimming in the deep blue waters, where the bottom of the ocean is miles away, this young Sperm whale came to visit. With her huge dark head and jaws, small eyes, about 35 feet long, she seemed to be alone (although who really knows what is below in the blue black waters). 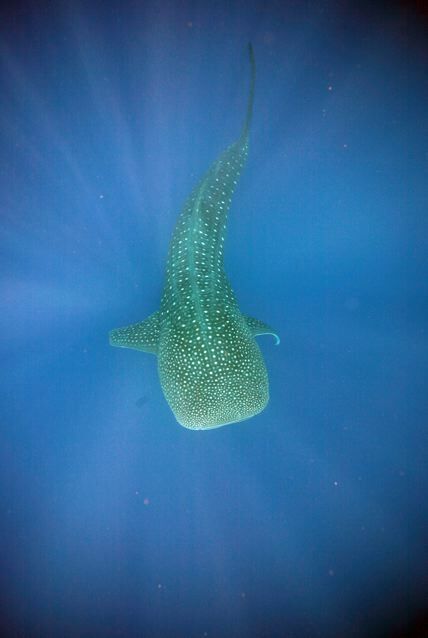 She approached us as we were swimming alongside our boat. 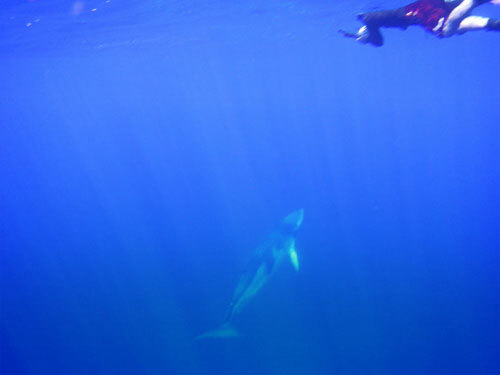 We were a group of women who had been communicating with dolphins and whales that morning and decided to cool off in the bluest blue water you will ever see, the deep Hawaiian waters about 10 miles off shore. You can imagine how surprised we were when she surfaced and spouted alongside us. We were startled and then amazed to see her so close. 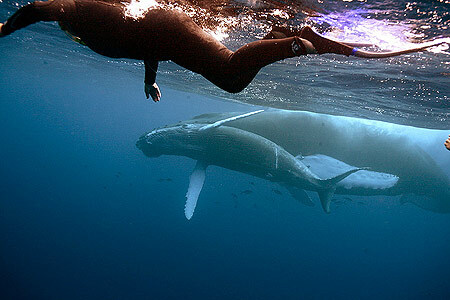 The presence of a Sperm whale surrounds you with a feeling of great peace. And so we became suddenly silent and respectful. After a number of loud and powerful blows, she slowly arched her massive body and dove down. With our thoughts, we said Thank you and Goodbye as we watched her disappear. Disappear, except for a spot of white skin that was on the edge of her lower jaw. Looking through our masks, we silently observed that last speck of white, fading into the deep blue as she slowly spiraled down. And then to our surprise, she rolled over and slowly, slowly, began her ascent to the surface choosing to come up next to us again. We held our breath, watching. Could this be true? She is coming up next to us again. No one moved. She did this repeatedly, surfacing and then slowly diving and quickly returning. We felt she was playing with us and enjoying our company. Perhaps she could sonar us best from down below, getting to know us, trust us. Maybe she thought we might follow her into the deep. We enjoyed this unique encounter and this inter-species friendship. 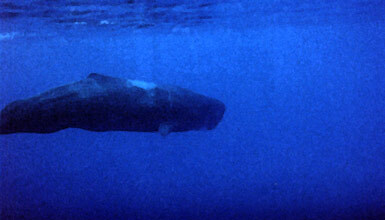 Anyone who has ever met a Sperm whale in the wild knows, they can swim extremely fast and dive thousands of feet whenever they choose. She stayed in the ocean with us for over an hour. 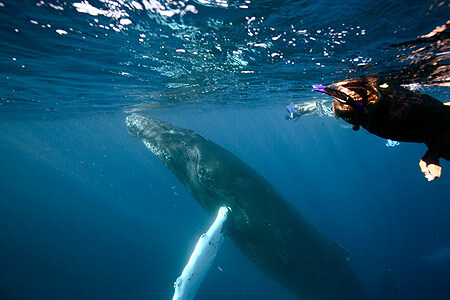 The experience in the water when she is nearby, is of complete concentration on her. The waves, the murky water, whitecaps, bumping into each other, did not interrupt our pleasure in viewing this unusual whale. We were fully present and in contact. 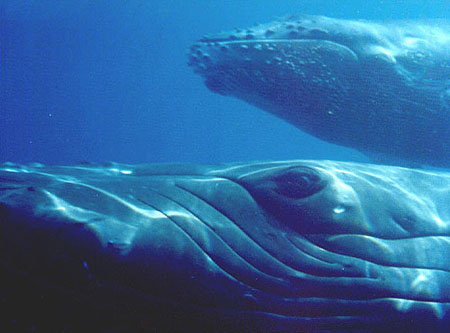 The brain of the Sperm whale cogitates and transmits volumes, sending acoustic images, feelings and thoughts. The intelligence is so vast, beyond our comprehension. The ocean seems to be a conduit upon which her messages float; a huge amphitheater with surround sound and waves of holographic images all around us. It created a field of total love. Inside her mind, we were immersed in another world, very ancient and wise. Unable to speak, we floated within this vast consciousness in gratitude, absorbing her wisdom and connecting with a higher Mind, beyond separation. Experiences like this change you. We were changed by this contact, uplifted, in a permanent way that led to practical changes in our lives. Rather than working so hard to change the old world, we knew we would create a new world. A world of love and cooperation. This was the message of the Sperm whale. 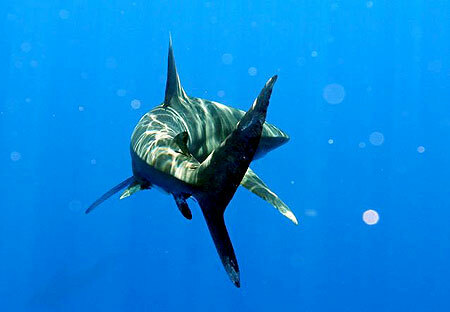 This is part of the Beauty and Mystery of living and swimming within the waters of the blue Pacific. I hope you will join us here. 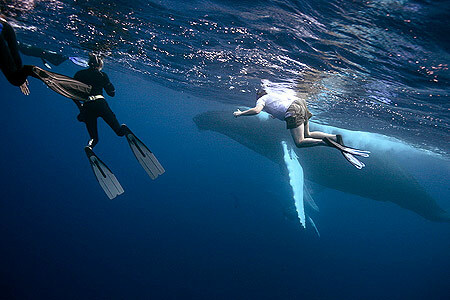 her cousin, the Blue whale being the largest. 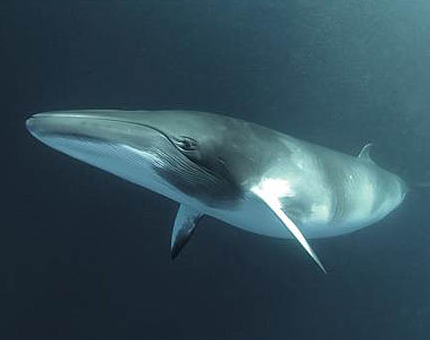 The newborn Fin whales are approximately 20 feet in length, born after a gestation period of eleven to twelve months. Sometimes called "Finbacks" the Fin whales migrate in groups, with individual whales a mile or more apart, yet still part of the same group. Their language is acoustic and they easily communicate over a range of 20 to 30 miles. 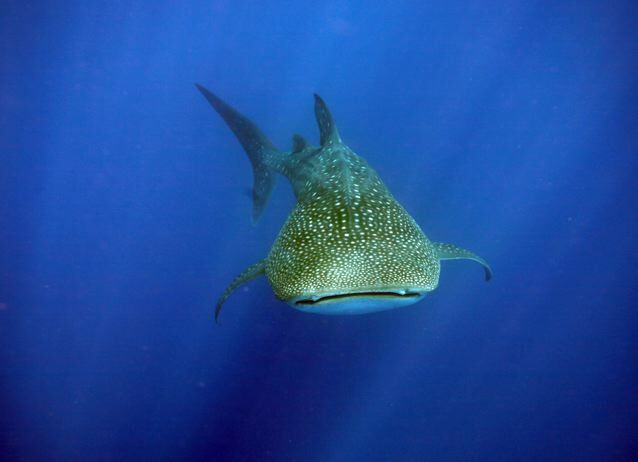 Although they are seen within 200 miles of Hawaii, I photographed this one in the Sea of Cortez. a family or personal god, a deified ancestor, assuming the shape of a shark. he and his grandmother would feed the sharks by hand. All photos &COPY; Dolphin Connection unless otherwise noted. All rights reserved.